The 3D apps are an important part of the Optimus 3D software - so much so, in fact, that they have their own category in the menu. Using 3D Games & Apps you can get a list only of the 3D-enabled apps on your phone. However, the Optimus 3D came with four 3D-enabled games. That's not a lot of content, but it’s more than what most Android handsets deliver - and these four are all with 3D effects. The games in question are Lets Golf 2, Nova, Asphalt 6 and Guiliver's Travels so there should be something for everyone. Much like the gallery, each of the games has a toggle to set the depth of the 3D effect and you can even get rid of it all together if you feel like it. It's a pretty complete package if you think about it, though some 3D-enabled apps would have been nice. 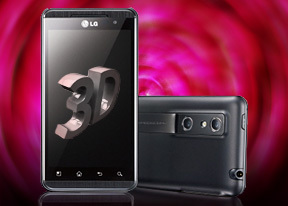 The LG Optimus 3D features great SNS integration. Both Facebook and Twitter contacts can be added to the phonebook and you can link those to existing phone contacts – in fact, the first time you create an account, the phone will offer to import the contacts from that social network. The LG Optimus 3D is running Android 2.2 Froyo and has a WVGA screen, which should give it access to the majority of apps in the market. However, there's a notable lack of apps that support 3D screens. This is worrying - we found promises of 3D-enabled apps being developed, but nothing actually inside the market. And even if all those apps are eventually entered into the Market, you'd still be looking at a very limited selection of 3D-enabled apps. You need to go to LG World for that. Even there, pickings are very slim and there's no simple way to view only the 3D-enabled apps. Searching for "3D" yields apps that are 3D (as in 3D graphics) and ones that are 3D (as in stereoscopic). Wikitude 3D was really the only app we found and installed that supported the Optimus 3D's screen. There's a shortcut in the menu called 3D games, which takes you to a website where you can purchase some games that support a 3D screen. We counted six games at the time of this writing. Anyway, the regular Android Market works as usual. It shows featured apps on top and below them, three sections (Applications, Games and Downloads). There is also a shortcut up there for initiating a search. The LG Optimus 3D comes with a built-in GPS receiver. It got an accurate GPS lock in about a minute and a half. If you need only general location (within 100-150 meters) for location-based services, you can use Cell-ID and Wi-Fi network positioning. The Google Maps 5.3 is part of the standard Android package. It uses vector maps, which are smaller and download faster but also support cool 3D views. You can use the two finger camera tilt and camera rotate gestures to look around (though 3D building are not available everywhere). There's no switch to use the 3D capabilities of the display either, but maybe some industrious dev will fill that void.